Florida Snake Control, rat control, bat control, raccoon control and exclusion, mole removal, hog capture, opossum trapping and control. You just name a Florida nuisance animal, and we will trap it remove it by humane means, and assure that your home or business is safe from a repeat infestation. Call us if you have animal problems in Tampa, Orlando, Palmetto, Sarasota, Bradenton, Venice, or Port Charlotte. We trap nuisance wildlife all over West Central Florida. Raccoons or rats in your attic? Bats? Or maybe you don't know what's making that noise in your attic. That's where Nuisance Wildlife Removal, Inc. can help. 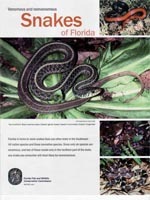 We answer all types of Florida animal control calls including opossums, armadillos, squirrels, snakes and moles. If your problem has wings, we handle bee, wasp and bird control as well as nuisance duck and bat calls too. We can provide an animal control solution for almost any nuisance critter. And Nuisance Wildlife Removal always uses humane trapping methods and relocates animals as allowed by law. Our licensed and insured professional wildlife trappers will come to your home or business, inspect the property, determine what type of nuisance animal is causing your problems and take the steps necessary to provide the full animal control service and/or animal trapping method needed to keep your home, family and property safe. When the wildlife has invaded your home - in addition to the wildlife trapping and animal removal services we offer - Nuisance Wildlife Removal can provide animal proofing and exclusion services as well as attic restoration if needed. We specialize in several areas of Florida animal control including bat control and removal, snake control removal, raccoons in the attic or squirrels in the ceiling. Call us for more information about our full service animal control, trapping and exclusion methods that will help get rid of the critters in your attic or anywhere else! Sometimes you don't hear noises in your attic or wall, but you sure can smell it! Nuisance Wildlife Removal can locate the dead animal inside your building, remove it and use an enzyme in the surrounding areas to help eliminate the odor completely. Nuisance Wildlife Removal is dedicated to the protection of your family's health and property. We are a family owned and operated business serving Manatee, Sarasota, Charlotte, Hillsborough, Pinellas, Polk, West Palm, St. Lucie and Orange Counties in West & Central Florida for more than twelve years. Using the latest trapping techniques available, we have perfected a safe, effective and humane system of trapping and relocating nuisance animals. Our goal is to provide complete satisfaction to all of our Florida customers - to do that we offer a full array of services that will take you through the process of trapping, removal, repair, decontamination when necessary and finally, we work with our customers to make sure the nuisance does not come back. We will even remove dead animals and treat the area for odors. Nuisance Wildlife Removal is committed to providing safe, effective and humane solutions to all nuisance animal problems in private homes and commercial properties throughout Florida.